World War 1 evolved aircraft technology along all frontiers - graduating them from their original canvas-over-wood construction to increased incorporation of metal throughout. The development of aircraft during the period of the Great War has always been a source of personal enjoyment. The assassination of Archduke Francis Ferdinand, heir to the throne of Austria-Hungary, and his wife in Sarajevo, Bosnia on June 28th of 1914 set off a conflict that engulfed Europe, and America. When Austria declared war on Serbia that day. By the end of the year, the regional conflict exploded into a war that spanned the globe. The history of World War One aviation is a rich and varied story. 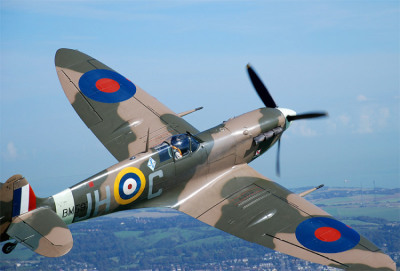 It was marked by a period of very rapid technological development, where aircraft evolved from their humble beginnings as unarmed slow moving, fragile, powered kites, into quick, agile, sturdy, deadly fighter craft and rigid bombers bristling with machine guns and a large load of bombs to bring the battle to those on the ground. The skies soon became a dangerous place where sudden death waited for the unwary or unlucky. The first airplanes were not seen as offensive weapons but as “scouts”. Even at the end of the war, the fighter types, such as the Sopwith Snipe and Fokker D8, were still classified as scouts. 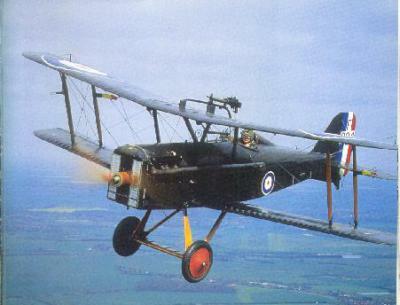 World War I was the first time that aircraft had been used for combat on a large scale. At first, they were used mostly for reconnaissance and later for fighting and bombing. 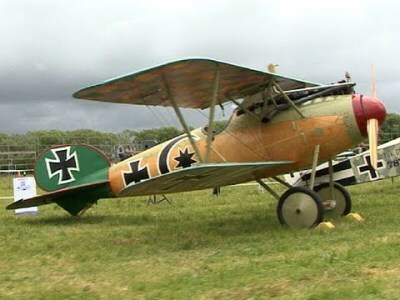 There were about 70 different types of World War I planes, including fighters and bombers. Different countries used different markings so that their soldiers wouldn’t shoot the planes down. Manfred Richthofen, also known as the Red Baron, was the leading German Ace, or fighter pilot. He became a hero in Germany and was awarded dozens of medals. He shot down 80 Allied planes, more than any other Ace. His plane’s engine is on display in the Imperial War Museum in London, and the control stick is in Australia. World War I planes often fought each other in the air, in battles known as dogfights. The Germans invented a way to fire a machine gun without it shooting at the plane’s propeller. April 1917 was called Bloody April by the British Royal Flying Corps because they lost so many planes and pilots. In that one month they approximately 245 planes and 200 pilots. 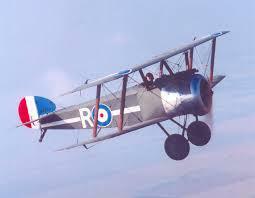 The British Sopwith Camel was one of the most famous World War I planes. It had a top speed of 185 km and were credited with destroying 1,294 enemy planes. One of the most well-known bombers of the war was the Handley Page V 1500. It was almost 20 meters long, carried up to 30 bombs and could carry nine men. World War I planes were widely used during the Battle of Verdun and the Battle of the Somme. Observation balloons were widely used and were often shot down by the enemy. A Belgian pilot, Willy Coppens, shot down 35 of these balloons during the war. They fought in canvas and wood biplanes that could barely fly 100 MPH. 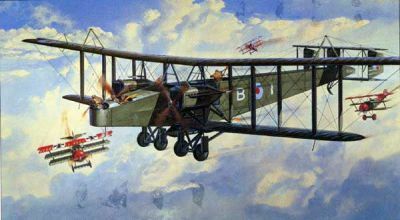 Men like von Richthofen, Rickenbacker, Bishop, Guynemer, Mannock, Ball, who flew airplanes with names like Spad, Fokker, Albatros, Nieuport, and Sopwith Camel. High above the trenches, they fought heroic battles with these primitive weapons. In this era, the top speeds were about 100 MPH. When the pilots ventured ten miles over the enemy lines, that was a notable event. The pilots carried no parachutes. The airplanes were made of wood and canvas; when they caught on fire, it spread quickly and spelled certain death for the occupants. The press and public, desperate for propaganda heroes amongst the waste and useless battles of the trenches, idolized the young heroes.